Let's look at another portable hi-fi manufacturer's album art support. This week we take a look at the players from FiiO, a Chinese electronics company. 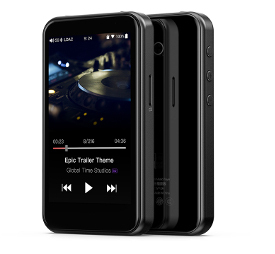 Like other companies covered on these pages, FiiO concentrate on the "high-end" hi-fi section of the portable music player market. As is common in the portable hi-fi market, the players have high quality DACs alongside large displays from which you can playlist music. 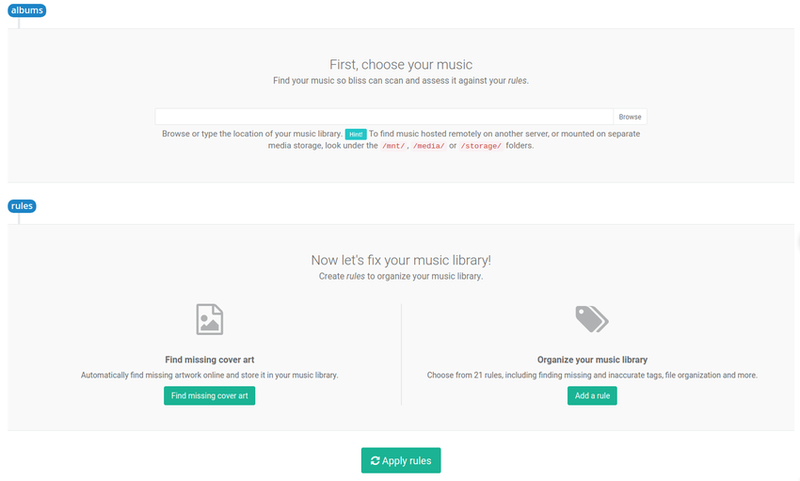 So: the same old story; the music sounds great, but music library navigation is very dependent on how well you have previously organised your library. One of the more important aspects of music library management is cover art. Artwork is important because it makes browsing and identifying music easier... plus it just looks cool!. However, the software on the FiiO player needs to know where to find the cover art that is in the library. Even if you've put effort into finding the artwork already, if it's not stored in the correct manner the FiiO won't show it. A separate image file can be used. This should either be the same name as the music file or, if not, the image that is alphabetically-first will be chosen. Artwork should be under 1MB in size. Artwork should be below 1024x1024 for PNGs, or 8192x8192 for JPEGs.Given the difference in file size between PNGs/JPEGs, this sounds like the 1MB limit restated. PNG, JPEG and BMP only are supported. 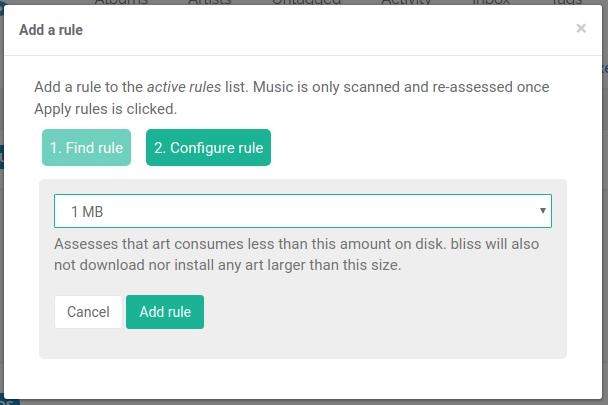 Using bliss we can automate the fixing of our existing artwork so it displays in FiiO players, and also encode and store the rules so future music also shows its artwork. First, download and install bliss. There are downloads for other platforms on our download page in case you're downloading for a NAS or some other device. Now, locate your music library in the albums section. Use the Browse button to find the folder in which your music is stored. You can do this directly on the device if it's connected to the computer and the drive is mapped to a drive name (Windows) or mounted to a folder (macOS, Linux). 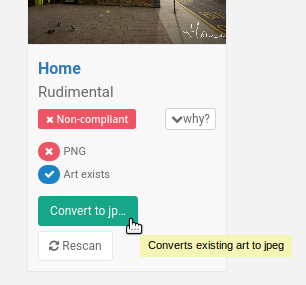 I've elected to save the image file in a separate cover file, this will mean cover.jpeg or whatever extension is appropriate for the format of the image file. As FiiO players support embedded art you could omit this setting by clicking the 'x' next to cover. Click Add rule; this just saves the rule, it won't apply it yet. After you click Add rule you'll notice the Manual/Automatic switch. This configures bliss's behaviour when it sees a non-compliant piece of existing art. If you already have art and it's over 1MB, and you have this set to Automatic, bliss will shrink the artwork for you. Otherwise, you'll get a one-click fix to perform the shrinking manually. I've decided not to add a rule for maximum resolution. This is possible with bliss, but I think it's derived from the 1MB maximum data size, so I concentrated on that. In addition, the resolution is documented to depend on the format, and we don't have a way to vary it according to the format. 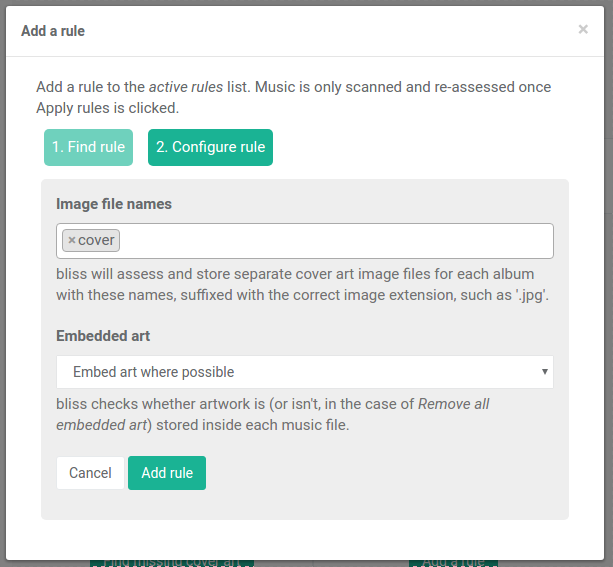 Click Apply rules to start bliss scanning for albums and fixing artwork. Any album without a cover.jpeg or embedded art will have those filled. 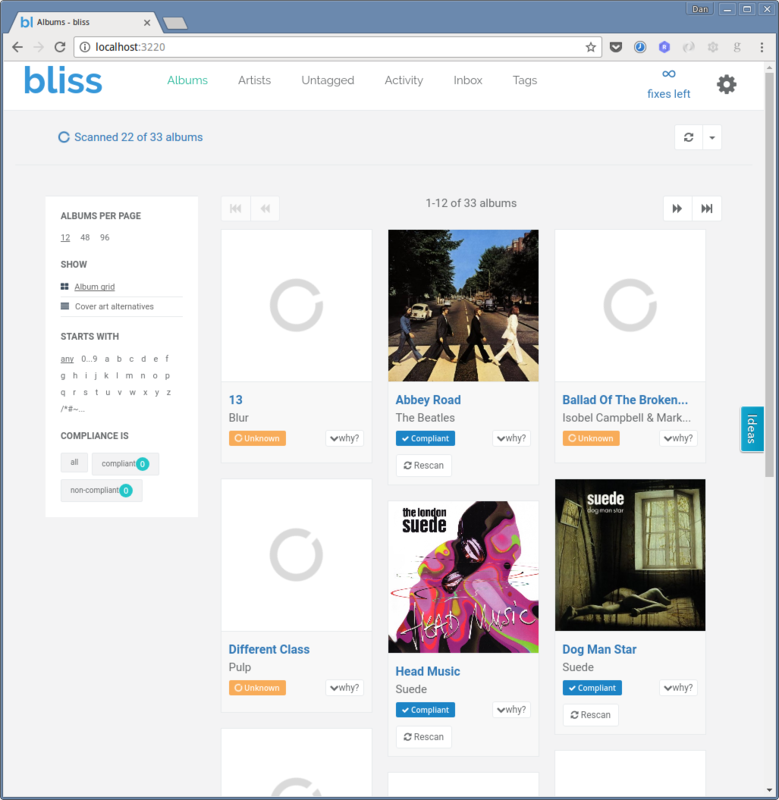 bliss uses, in order of preference, existing art (from cover.jpeg or embedded if they exist) or if there's no existing art, bliss performs a lookup and finds the artwork online, embedding it in the right places. Any existing artwork which is not in the correct format or is too large will be identified. 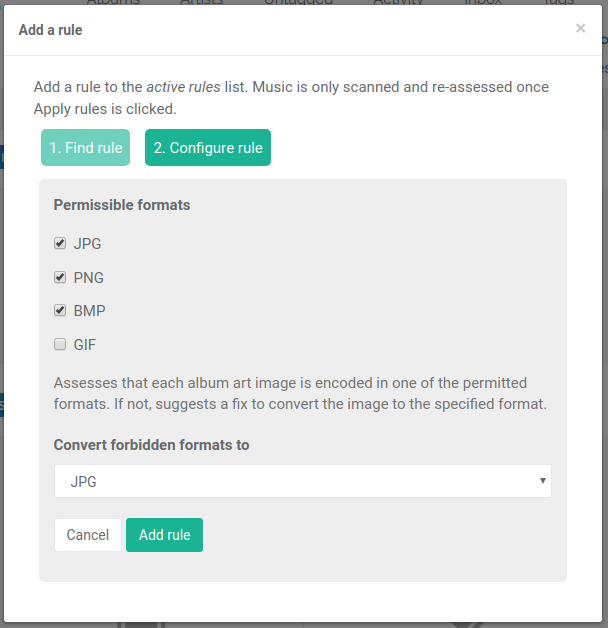 The size rules can be automated, but the image format rule will not be fixed automatically. We'll get a one-click fix for that later. You can also make fixes in batch on the Inbox page. Most devices need to be "rescanned" to re-read the updated music files and any newly added or fixed album art. With the FiiO music player app shipped with the device, you can do this from the player itself by clicking: Settings icon > Scan for songs > Scan all music. I hope this helps fixing your album art for your FiiO device! If you have any more tips about organising your music library for these devices, please let us know in the comments (or send us an email).